"In wishing to rid myself of the mannerisms of a country other than my own I have gone to the art of a people who had never seen or known anything different from themselves ... These are the Australian aboriginals [sic] and it is only from the art of such people in any land that a national art can spring." 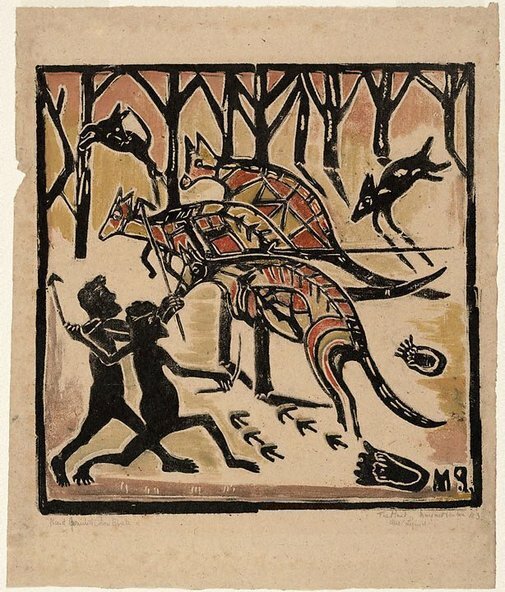 Margaret Preston's appreciation and understanding of Aboriginal art and culture grew in sophistication from the time she made her first pronouncements on the subject in the 1920s. During her life she made several visits to Central and Northern Australia, and visited rock art sites in and around Sydney, where she lived. The Australian legend series was made towards the end of her career and integrates colours and compositions derived from Aboriginal paintings, as well as motifs from rock art. For example, the large human footprints in each of these prints were taken from rock carvings in the Sydney area which Preston had seen on excursions with the Anthropological Society of New South Wales.